- A drinks voucher to the value of £5. Enter here, in ProPool forums, then check to see if you're entered into the Pro9 full list of players here! I can only imagine what the atmosphere will be like in the final and they are playing a match for this kind of prize money - but I want to be there if it happens. This is pretty local for European Pool Fans (it has been held in the Philippines for the last few years) so make the most of this incredible free prize competition, and support your team, and hopefully this event will stay in Europe for a few years! Can you imagine seeing these pool superstars playing for a $60,000 pay day - and you're watching it LIVE and free because you entered and won our competition? Good luck ProPool forum members! EVERYONE WINS FREE TICKETS IN OUR COMPETITION! 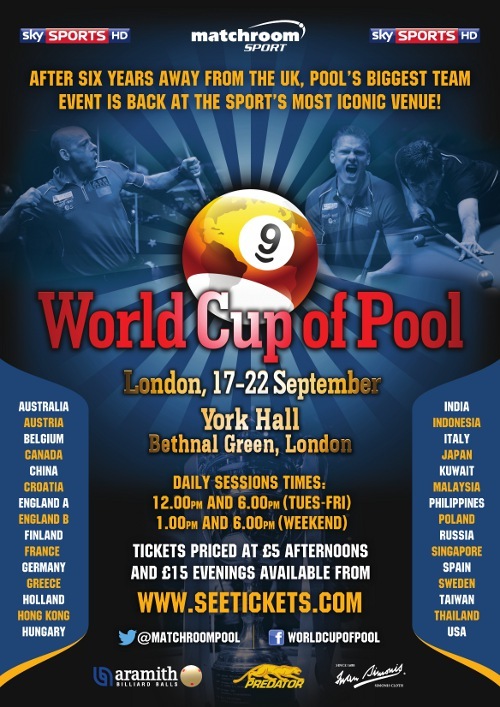 Hundreds of free tickets are reserved for YOU to watch the World Cup Of Pool in London - everyone wins a pair of free tickets to watch the session of your choice. Visit Pro9's forums for details of how to claim your tickets!